A bear had been ravaging the farmer's livestock for the greater part of two years. He would make his rounds at night and terrorize the chickens such that they would not lay eggs for the farmer. The cow's milk production was down because of the fear placed by the nightly visits from the bear. This troubled the farmer because he was unable to make traction with the demands of his customers. The hunter had tried many different ways to catch this troublesome bear. He tried chasing it down with rifles, he tried smoking it out of the forest with controlled burn fires, he tried luring it into traps with sacrificed and quartered venison meat. In all attempts, the wiley bear seem to find a way to ellude the farmer and continue to terrorize the farmer's livestock and impact his farm's productivity. One evening, the farmer happened to notice a group of rabbits gathered in a field on the edge of the forest which the bear called his home. He noticed that the rabbits went about their business gathering food to bring back to their rabbit dens to feed their young. The farmer had had run-ins with the rabbits in the past when they attempted to sneak into his garden to eat his turnips and dig up his carrots. He'd solved that problem by errecting a fence of chicken wire which he used to keep the rabbits out of the garden. The rabbits adapted to the fence in that they found other ways to survive. They ate the grass in the field that the farmer seemed to not care about. All the while, most concerned with their existence and keeping out of the farmer's way. Observing this, the farmer thought- there must be a way to have the rabbits help me with the bear. After all, the bear is much bigger than they are and they must be afraid of him as well. If there was no bear- then the rabbits could surely find more food in the forrest that they could live in and I could go on my way producing farm goods that all would have to purchase from me. So the farmer set out to speak with the rabbits. "Little rabbits- I am the farmer and owner of much of this land. I am sure that you have noticed that there is a bear that has been terrorizing the lands. He is a mean bear and looks to make your life difficult. He is much bigger than you and will surely look to eat you next and terrorize you like he has my chickens and cows. My poor chickens and cows have been loyal to me and look what they have- they have a nice barn to live in, plenty of hay to eat and corn feed that I provide. They lead a comfortable life. I could provide you plenty of carrots so that you would not have to work as hard as you do eating grass in the fields"
The little rabbits thought- that might not be bad. The fields are tough and the hunters look to shoot at us and have killed some of our family members or caged them up. If the farmer could provide protection we would be ahead our lives would be better. So they sought to help the farmer catch the bear. 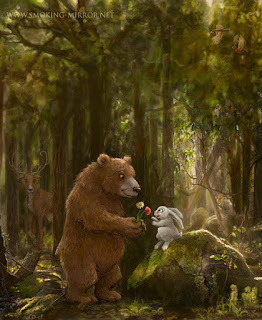 As time passed, the farmer and rabbits worked to keep the bear in the forrest. The rabbits would tell the farmer about the bears whereabouts and the farmer and his friends would chase the bear down so that the bear would not leave his den. The farmer spent much of his time and energy on the Bear and limiting his existence. This took it's toll on the farmer's land, the fields that the rabbits once ate from. The grassess of the field grew less and there was less hay to feed the cows. There was less corn to mash and feed the chickens. As time went on the cows and chicken's grew less happy with the farmer and his ability to provide for them. There was unrest on the farm. The hunters still continued to hunt the rabbits. This made the rabbits unhappy. The farmer had taken to not watering the fields and taking care of his crops. He spent much of his time going to the general store to purchase steel traps and ammunition with which to catch and scare the bear. Finally the fall came and there was no bountiful harvest to reap. The fields lay barren with little corn and grass to make hay. The rabbits while still happy that they were rabbits and pursued happiness in the little that they had, they grew in numbers. They ate bits of grass even though there was less of it to eat. They adapted to their new conditions. The farmer obessed with the bear- sought out to devise a plan to catch the bear one last time. He felt that if he was only able to catch the bear and banish him from the land all would improve. He devised a plan to set a trap. A small but devious trap that would catch the bear and show everyone once and for all how this bear was the root of all problems in the land. So the farmer set out a trap on the edge of the forrest by the river where he knew the bear would come out to catch fish to eat. As he looked for bait for his trap- he thought of the perfect bait. I needed to be something small that the bear could not resist. As he looked around him- he saw the hundreds of rabbits that there now were and thought- I will take a young rabbit and use him in the trap for the big bear. So the farmer called a meeting with the rabbits and told them of his plan. "The trap is a large one but has a small area for the bait" said the farmer. If we catch the bear and banish him- you can live in the forrest and the berries of the forrest will be yours. The rabbits while skeptical of the farmer's plan, but they thought of the forrest- there were alot of fallen trees that they could use to live in. The forrest had alot of plants and tree roots that they could eat from. If they helped the farmer- this could be theirs. So the rabbits asked the farmer- "what do you need from us?" "I need your smallest rabbits to place in the trap it will be best and the bear will not notice it until it is too late" said the farmer. After much thought, they acquiesced to the farmer's demands and produced their smallest rabbits for the bear trap. The farmer craftily set the trap with the small rabbits. The rabbits where worried for their young. Then came the day of catching the bear. The Bear awoke from his nights sleep and went to edge of the forrest by the river to catch a fish to eat. As he walked by the area where he trap had been set, he saw the scarred little rabbits in the trap. He said to the rabbits- "what are you doing in the trap little rabbits? Who could have done this to you?" "Please don't eat us Mr. mean bear. We are small helpless rabbits who are just looking for berries and plants to eat from" said the rabbits. "I will do no such thing- for we are all animals and we all eat from the forrest and the fields." said the bear. The bear went about his way and left the small rabbits in the trap. During the night- a group of hunters had stumbled upon the trap and took the small rabbits. The next morning, the farmer rose early and went out to the edge of the forrest by the river to see if he had caught the bear. The entire rabbit community followed the farmer prepared to claim the forrest that the farmer had promised. As they arrived at the site, the farmer was dissapointed to find the small rabbits gone but no bear in the trap. How could this have happened thought the farmer? The rabbit community was dismayed that their young rabbits had been placed in harms way by the farmer and the bear had not been caught. "Mr. Farmer- what about our young rabbits and our forrest?" said the rabbit community. "You have many in your community- they will not be, missed after all- you are rabbits" said the farmer. "Yes, we are" said the rabbit community and went back to the fields to eat grass. -The true power for the Latino community does not lie with the farmer nor the bear. Not with the comfort of the farmer's barn or the fertile forrest. The power of the Latino community lies in our numbers, our work ethic, our desire to risk all in search of a better way of life for us and our children.